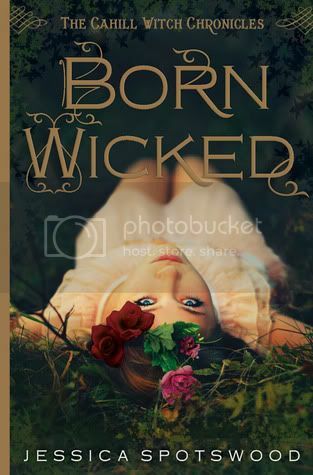 I decided to read Born Wicked at the insistence of a fellow blogger. I am SO glad I let her talk me into reading the book. I love novels about witches, and this one was just fantastic. The story centers around a young girl named Cate, and her two sisters, who are witches. Witches are absolutely forbidden by the Brotherhood. When caught, most are either put to death, sentenced to a prison ship, or put into an institution. Because of this, Cate must keep herself and her sister’s safe at all cost, and from everyone. Poor Cate; she had so many responsibilities and at such a young age. I definitely sympathized with the choices that she was forced to make, and with such heavy burdens heaped on her shoulders. But I found her to be a very strong character, and I really enjoyed reading about her. I found the sisters, Maura and Tess to be quite likeable as well, although Maura not quite as much as Tess. Tess was awesome! Cate has two love interests in the story; Paul and Finn. I adore the relationship between Finn and Cate. Finn was such a very interesting character; I thought that he and Cate made such a great pair. I loved that he was willing to do whatever he had to do to keep Cate safe. I love Finn! Paul on the other hand, seemed a bit sneaky to me. I know he had to be up to something, but I couldn’t put my finger on what. The Brotherhood sounds like an absolutely horrible association. Just reading about them gave me the creeps, and I held my breath hoping that they wouldn’t catch on to the girl’s secrets. The Sisterhood, which is an affiliation with the Brotherhood, didn’t sound much better either. The storyline for the book was highly addictive, and the pacing was absolutely perfect. My attention was held throughout the book, and I finished most of it in a few hours time. I absolutely loved the historical setting for the story. The world building was wonderful, I could clearly imagine myself having tea parties and hanging out in Cate’s special garden. Overall, this book is definitely worth the read. I am SO glad that my awesome blogger friend, Kathy, insisted that I read the book as soon as possible. I am officially hooked on this series, and cannot wait to get my hands on the next book. Don't forget to watch the book trailer! I Love it! Questions leap from the pages and incite a hunger for answers that keeps you flying through them. I loved that aspect, in which we feel like we need to know more and as quickly as possible! And don't you get me started on Finn. Gawd, the studious hunk makes me crazy! I just reviewed this book today too. I really enjoyed it and also felt that Paul was super sneaky. I am still undecided about him! I can't wait for book two! Swooon! Finn. I love that feather scene. Cate is awesome! Tess is also awesome. I loved the family history, intricate plot. I can not wait to find out more about certain things. Great review Christy! I am so glad you read it and loved it. It's one of my favourites. Eep! I can't wait to read this I have my copy all ready and waiting! It sounds so good and I love th sounds of the characters and love interests! Great review! Thanks for the great review. I wasn't originally interested in Born Wicked, but the reviews have been really positive. I've been on the lookout for a good witch book so I'm going to give this one a try. MUST READ! I've read so many awesome reviews for this one in the past week and I really just need to go to the store and pick up a copy:) Based on everyone's thoughts, this book seems to be living up to the hype and the gorgeous cover. Love it when that happens! Ahh! Awesome review. :) I've heard so many fabulous things about this one; I can't wait to read it! Witches, historical fiction, and family dynamics = automatic awesome. This book was SO awesome! Finn and Cate were fantastic characters and I loved them both. I love the trailer, too! It's just as amazing as the book. Great review, Christy! I loved this one so much! Finn is so, so dreamy. I can't wait for book 2! I really liked this one too, and I wouldn't have picked it up but so many bloggy friends recommended it. Like you, I love witch stories and Cate was a great character. Boy, I wanted to smack her younger, snotty sister! Very cool world. I loved Born Wicked. I have a soft spot for witches. Great review! This is very high on my to-buy-list of books and your review just made that need to get a copy as soon as possible even worse. :D It sounds like a fantastic and very addictive read and if you loved it, I'm sure I'll love it too!